Get a look from the grave in our Beetlejuice costumes. We have Beetlejuice and Lydia costumes of different qualities and prices. 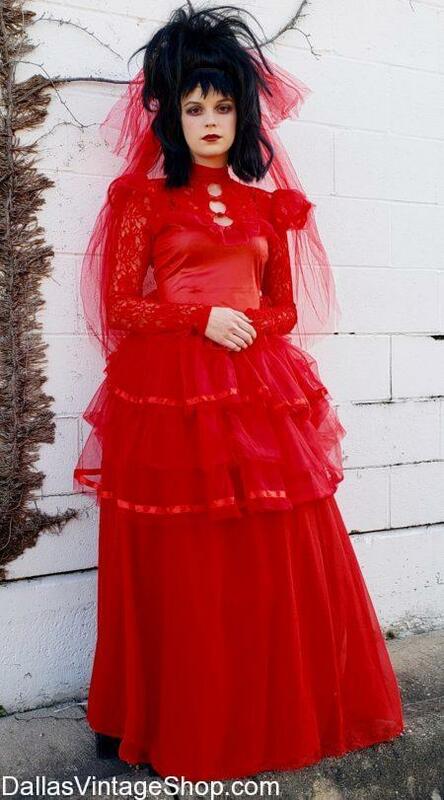 Movie Character Costumes, Beetlejuice and Lydia Wedding Dress Famous Couples Costume Ideas, and Fabulous Couples of Hollywood Cult Classics Costumes are waiting for you at Dallas Vintage Shop. Any Decade, Any Century, Any Theme, From Head to Toe or just the Clothing or Accessories you need. Find more Halloween Costumes and Ideas. Cult Classic Movie Costumes: Beetlejuice Black & White Stripe Suit. Luckily, now you don’t have to be a ghost to scare the pants off the living! With this Superior Quality Halloween Beetlejuice Costume, you can try out your haunting skills while looking like the “ghost with the most” himself. Wear this suit on it’s own or add a Monsterous Wig and some Ghoulish Ben Nye Face Makeup to look just like Beetlejuice! We have several versions from economy to top quality. This Horrible Beetlejuice is just one of the Thousands of quality creepy, scary complete outfits. You may just need Special Effects Prosthetics or Makeup. We have it all from Wigs, Masks, Weapons, Complete Outfits or just the pieces you need. Get complete Halloween costumes from head to toe or just the costume pieces or accessories you need. Please shop early for Halloween. We will not run out of Halloween costumes but we will become crowded as online and pop-up shops run out of stock. Create a Killer Costume with this Michael Myers Mask and Jumpsuit! You can’t have a Halloween Movie without the Iconic White Michael Myers Mask. We have several kinds from Superior quality to Economy. Looking for a different Cult Classic Halloween Costume villain? We’ve got you covered at Dallas Vintage Shop! You may just need Special Effects Prosthetics or Makeup. We have it all from Wigs, Masks, Weapons, Complete Outfits or just the pieces you need. Get complete Halloween costumes from head to toe or just the costume pieces or accessories you need. Please shop early for Halloween. We will not run out of Halloween costumes but we will become crowded as online and pop-up shops run out of stock. You are in Movie Cult Classics category.